A cotton swab is a short spindle with one or both ends coated with an absorbent cotton padding. Such swabs have long been used for various cosmetic and personal hygiene tasks, particularly for cleaning the ear. The cotton swab was invented in the 1920s by a Polish-born American named Leo Gerstenzang. Leo had observed that his wife used a toothpick stuck into a piece of cotton to clean their baby's ears at bath time. Leo was concerned that the wooden toothpick might splinter and cut the baby's ear or that the cotton might come off the stick and become lodged in the ear. He decided to design a ready-made cotton swab that could be used on babies with less risk of injury. Thinking that such a product would appeal to many parents, Leo formed the Leo Gerstenzang Infant Novelty Company to market his swab and other baby related products. It took him several years to solve certain design problems, like how to secure equal amounts of cotton on each end of the swab. Eventually, he not only developed a successful product but he even created special packaging for his swabs. The package was designed to be opened with one hand so a parent holding an infant with one hand could easily open the box and extract a swab with the other. Once Leo had perfected his product, he looked for a commercially viable name. Because he designed his product to keep infants happy as their ears were safely cleaned, he chose the name Baby Gays. In 1926, he changed the name to Q-Tips Baby Gays, claiming that the "Q" stood for quality. Eventually, Baby Gays was dropped from the name and the swabs became known simply as Q-Tips. Today Q-Tips is a registered trademark of Chesebrough-Ponds, Inc.
Cotton swab design has advanced significantly since the 1920s. For most applications, wooden sticks were replaced by paper spindles, which were less likely to splinter and puncture delicate ear tissue. The thin paper rods were made by rolling a heavy gauge paper. More recently, plastic has become a popular choice for spindle material because it offers improved flexibility and imperviousness to water. However, care must be taken to design the plastic shaft so that it does not poke through the cotton mass at the end of the stick. To prevent this from occurring, swabs have been designed with a number of special features. For example, some swabs are made with a protective plastic cap on the end of the spindle, under the cotton coating. Others use a cushioning element, like a dab of soft hot melt adhesive, to protect the end of the stick should it protrude through the body of the tip during manipulation. A third way of circumventing this problem involves a process, which results in a swab with a flared tip. This flared tip can not penetrate too deeply into the ear because of its larger diameter. 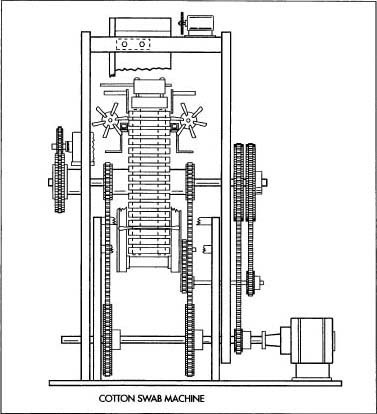 A typical cotton swab-making machine. swabs may be specially designed for cleaning electronic parts; these may have special lint free requirements. There are three primary components involved in swab manufacture: the spindle or stick, which forms the body of the swab; the absorbent material coated onto the spindle ends; and the package used to contain the swabs. Spindles can be sticks made of wood, rolled paper, or extruded plastic. They can be made to different specifications depending on the intended use. Personal care products are fairly small and lightweight and are only about 3 in (75 mm) long. Swabs made for industrial use may be more than twice as long and are typically made of wood for greater rigidity. Cotton is most often used as an end covering for swabs because of its absorbent properties, fiber strength, and low cost. Blends of cotton with other fibrous materials may also be used; rayon is sometimes used in this regard. Manufacturing processes essential to cotton swab production. 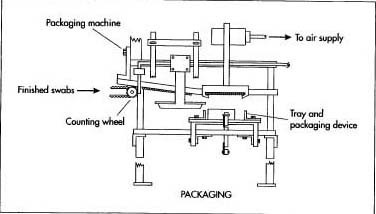 A schematic drawing of a typical packaging machine used in cotton swab production. which is attached to a fiberboard backing. Chesebrough-Ponds holds a patent on the design of a self-dispensing package for their Q-tip products. This patent describes a package made of a plastic bubble body with small projections molded into the plastic for the purpose of re-securing the cover onto the body. Other packaging used for swabs includes paper sleeves. This type of packaging is common for swabs used for microbiological applications, which must be kept sterile prior to use. Different methods are used in swab manufacture depending on the design of the swab. In general the process can be described in three major steps: spindle fabrication, cotton application, and packaging of the finished swabs. 1 Spindles are made several ways depending on their material of composition. Wooden spindles are shaped by various lathe processes. Paper spindles are made by die-cutting a heavy grade paper and then tightly rolling the paper to form a stick. Plastic spindles are made by an extrusion molding process. In this case, the plastic resin and other additives are blended together, heated, and extruded through a die in a process similar to a the way a pasta maker squeezes out a strand of spaghetti. After manufacture, the spindles are loaded into a hopper on the manufacturing line in preparation for cotton application. 2 One U.S. patent describes a complex operation involving a series of workstations. At the first station, a hopper full of spindles is vibrated to cause them to fall through a long, thin slot at the bottom of the hopper and onto a rotary stick carrier. This carrier is a drum type mechanism with cross slots placed around its outer rim. The sticks enter these slots one at a time and are carried to the next station. 3 As the wheel moves the sticks along, they contact a rotating friction wheel that rubs against the swab spindles causing them to spin. The carrier advances the sticks through a glue pot station where adhesive is applied to the opposite ends of the sticks. 4 At the next station, incoming cotton in the form of a rope is fed onto another rotating wheel with a series of metal fingers extending from its hub. These fingers direct the rope of cotton to the glue-coated ends of the sticks as they move along the wheel. In the case of Chesebrough Pond's Q-tips the spindles have a series of four to eight indentations, or shallow cuts, along their top and bottom. Presumably these help the shaft grab and hold onto the cotton as it is fed onto the shafts. The cotton then adheres to the spindle is wound tightly by the spinning sticks. 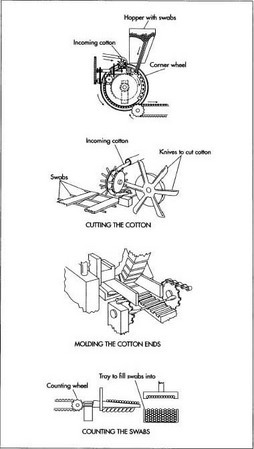 After approximately 0.05-0.1 g of cotton has been deposited on the spindle, a series of rotating blades severs the cotton from the rest of the rope. 5 The ends of the swabs then pass through a series of narrow channels while they are still spinning. These channels compress and shape the cotton on the end of the stick and give it a smooth shape. Chemical coating agents may be introduced to the cotton. These coating agents, which include cellulose polymer solutions, help the tip retain its shape and help prevent spotting and mildewing. Finally, an escapement wheel diverts the sticks from the carrier to a slotted transfer carrier belt and then to an automatic packaging unit. 6 On the way to the packaging unit, the finished swabs pass through a counting wheel. A guide rail holds the swabs in place while the counting wheel counts the number of swabs for one tray layer. As the swabs are counted, they are pushed up against an inclined plane. When the counting wheel signals that enough swabs have been collected, it sends a signal to a piston arrangement, which slides the group of swabs onto a paper divider. The divider and the swabs are then dropped into the plastic package. In subsequent operations, a paperboard backing is glued over the filled plastic container and the entire assembly is packed for shipping. The swab manufacturing process can generate waste in the form of loose cotton as well as plastic, paper, or wood scrap, depending on what material is used to make the spindles. Some of the cotton can be reclaimed and either incorporated back into the incoming feed path or used elsewhere as scrap. The plastic used in spindles is thermoplastic, which means it can be reground and remelted for later use. A number of quality control measures are used to ensure cotton swabs are acceptable. The spindles must be checked to ensure they are straight and free of imperfections, such as stress cracks or other molding defects. The cotton used to coat the ends must be of specific purity, softness, and fiber length. The finished swabs must be free from lose adhesive and sharp edges, and the tips must be tightly wrapped. These measures are particularly critical for swabs designed for infant use. For swabs intended for other applications, other quality requirements may be more important. For example, swabs used for biological purposes must remain sterile until used. For some applications, lack of loose lint maybe imperative. The particular quality control requirements will vary with the application. Of course, each box of swabs must be weighed to make sure the correct number of swabs are packed in each box. A more recent innovation used to help prevent the swab from damaging ear tissue is a swab with extra cotton filling the hollow spindle. To achieve the effect, the swab applicator is made by extruding a plastic tube over a resilient mass of cotton. One end of the stick is fitted with a cap and the other end has a more traditional swab-like protrusion of cotton. The cap can be removed and the fiber core filled with any liquid that is desired to be dispensed. This technique could be useful for applying a variety of cleaning fluids or topical medicines. Future developments in swab technology may play a role in space technology was well. The Micro Clean Company, under a technology license from National Aeronautics and Space Administration (NASA), has recently perfected the first cotton swab that has the absorption qualities of cotton yet meets NASA's lint-free, adhesive-free requirement for clean room use. This swab is enclosed in a nylon sheath and the wood handle is enclosed in a shrink film to prevent fiber release or other contamination. The shrink film allows the dowel to absorb more stress, making it easier to use and less likely to slip in the hand. The sheathing and shrink film can be custom designed for special applications or specific solvent compatibility. Feldman, David. When Did Wild Poodles Roam the Earth? Harper Collins Publishers Inc., 1992. Levy, Sidney. Plastic Extrusion Technology Handbook. New York: Industrial Press Inc, 1981. Mourkakos, George M. U.S. Patent 3698040. "Apparatus for Fabrication of Swabs." October 17, 1972. How much cost is saved by making the spindle out of plastic than paper/cardboard? It just doesn't seem worth the environmental impact of using plastic.